It shouldn’t really come as a surprise that Steven Spielberg and George Lucas collect the paintings of Norman Rockwell, but who knew? A current show at the Smithsonian highlights their holdings. (For the record, Spielberg is winning, with 50 pieces to Lucas’ mere 30.) 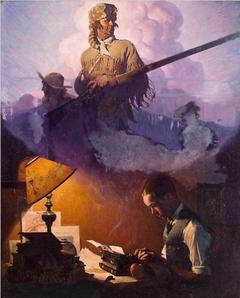 The painting reproduced with this post was commissioned in 1923 as an Underwood Typewriter ad. It was Spielberg's very first Rockwell purchase. He said in the NY Times, “I hung the painting over my desk... It was my deblocker. Whenever I hit a wall or couldn’t figure out where a story was going, I just looked up at that painting.” It all makes sense – the three of them and their love for drama and Americana and story-telling. Spielberg was quoted as saying, “He was always on my mind because I had a great deal of respect for how he could tell stories in a single frozen image. Entire stories.” Looking at the slide show on the NY Times website, you can almost hear the painted characters coming to life in one of their movies, not to mention on Main Street, USA. It makes even more sense to me when the show reminds me of Gregory Crewdson’s work. Two of the photographer’s big influences are the movie Close Encounters of the Third Kind and the work of Norman Rockwell, the local hero who lived and worked not far from Crewdson’s childhood country home in Lee, Massachusetts. I believe that at least one of these two filmmakers collect his photographs as well. The influence is all inter-connected. The show in D.C. is a must-see, especially as a follow-up if you were lucky enough to see last year’s show at the Norman Rockwell Museum, Norman Rockwell: Behind the Camera. It showed the process photos taken for his painitngs in teh studio. A book under a heel here and there made the subjects look like they were in mid-stride. PDN posted comparisons of the final paintings to their photographic studio predecessors.